Instead of simple traditional lawns, the University of Delaware’s Sue Barton is asking local homeowners to consider meadows to increase ecosystem services and add aesthetic beauty to landscapes. Barton, associate professor in the Department of Plant and Soil Sciences in UD’s College of Agriculture and Natural Resources, said that homeowners with larger yards — one or more acres — should especially consider growing meadows instead of lawns. The benefits of having a meadow include more plant and wildlife diversity, better water penetration and deeper root systems to filter water, Barton said. Meadows also increase pollinators and are beautiful if properly maintained. Some people may hear about installing a meadow and assume that it means they can just stop cutting their grass, letting it grow long and wild, but Barton said that’s not the case. “The real key is not to just stop mowing your grass but to mow edges, mow a path, have a curvy line at the edge, something that makes the meadow look very purposeful,” said Barton. Meadow versus lawn A lawn is defined as something that is routinely cut and maintained at a height somewhere between two and five inches. It is most desirable when it consists of a cool season turf grass species, but the definition of a lawn doesn’t mean that it has to be grass. “Usually, it’s primarily grass,” Barton said. “My lawn is pretty much all clover and weeds, but it’s still a lawn because it’s mowed regularly and kept short.” A meadow, on the other hand, includes taller, warm season grasses. 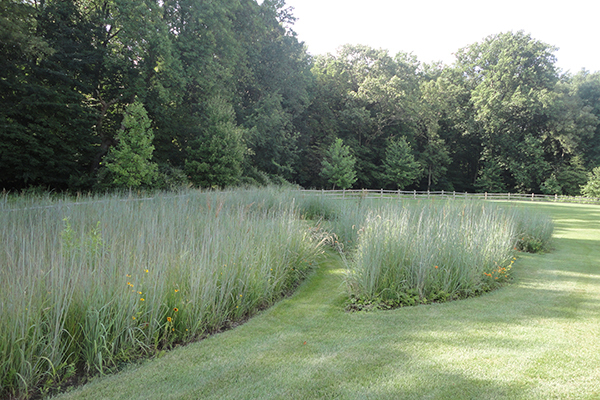 Examples of those native to this region include Indiangrass, switchgrass, prairie dropseed and little bluestem. Meadows can also have blooming perennials, such as butterfly weed and black-eyed Susans. But what plants grow in meadows will depend on soil types and the amount of available moisture. Installing a meadow In order to install a meadow, Barton said that there are two main strategies — stop cutting a lawn, while still maintaining a perimeter, and allow cool season grasses and plants such as Queen Anne’s lace and goldenrod to come into the meadow, or start from scratch and seed a meadow. In order to do this second method, Barton explained how a meadow was installed on a property in the Applecross neighborhood in Greenville. “We seeded that meadow, so we had to kill the existing vegetation. Then the strategy was to mix desirable warm season grass and a few perennial forb seeds with sawdust and spread that layer of seed and sawdust,” said Barton. “The sawdust does two things — it prevents light from hitting the soil to avoid crabgrass and foxtail, which are often problem weeds in a new meadow, and it also provides a moist germination medium for the desirable seed. It’s a good way to get a meadow started.” Meadow alternatives For those homeowners with smaller yards or yards with big, mature trees such as can be found in North Wilmington, sometimes, a meadow just isn’t practical or even possible. Robert Finocchiaro, president of Finocchiaro Landscape Co., said that for those who have smaller yards or yards where grass won’t grow, it is best to consider all options that increase biodiversity. “Plant bushes and groundcovers that will complement the look. There are a lot of landscapes up in North Wilmington where the trees have matured so much that you can’t grow grass,” said Finocchiaro. “The big thing is that they use mulch. What Sue is trying to say is maybe we can use leaves for mulch and do perimeter mulching, where you mulch right along the flowerbed. Maybe we can plant some understory bushes that will attract certain insects, which of course attract birds, and then have this little habitat in your front yard that looks very nice instead of just having mulch.” Finocchiaro also said that he realizes that in New Castle County, “somebody’s meadow might be somebody else’s un-cut yard,” but he wants people with the space to accommodate the option to keep an open mind. “If you have an isolated area in the back yard and it’s not a huge yard and you want to have the grass grow a little bit, I don’t see any problem with it. It’s kind of like a little transition zone,” said Finocchiaro. “What Sue’s trying to tell people and what I am trying to tell people is you don’t need two acres of maintained lawn any more. There are alternatives and what’s nice is this creates a little bit of a habitat that wouldn’t exist if you cut the grass every week.” Changing perception Barton pointed out that one way in which people can change their perception of meadows is to visit Longwood Gardens and tour its newly installed meadow garden that spans 86 acres and contains three miles of walking trails. Article by Adam Thomas Photos courtesy of Sue Barton This article can also be viewed on UDaily.